Joan Campion, 71, died on Oct. 13, 2011, at St. Luke’s Hospital in Bethlehem, Pa. Joan founded the South Bethlehem Historical Society in 1985. In the early 1970s, Joan was employed at the Bethlehem Globe-Times. Her published books include In The Lion’s Mouth: Gisi Fleischmann and the Jewish Fight For Survival, Smokestacks and Black Diamonds and Bethlehem, Pennsylvania: A City of Music. 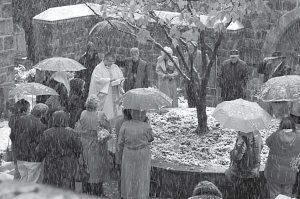 Joan’s cremated remains were interred in the Cathedral Church of Nativity’s Memorial Garden (above) at the conclusion of her burial service on a snowy October 29. The Very Reverend Anthony Pompa conducted the rites. After the service, friends and associates enjoyed a light lunch at a reception in Sayre Hall, where remembrances of Joan were shared by those who attended.